It is hot and humid. There is no arguing about that fact. And when that is the case, makeup takes a back seat and comfort is at the forefront. There is nothing worse than blending your makeup to perfection and then stepping outside into the sauna-like air only for everything to melt off and become a sweaty mess. Summer is the ideal time to dial back the heavier makeup routine and go with a glowy and lightweight feel. Not to mention you may have a bit of a tan going, which you do not want to cover up with a bunch of heavy foundation. You want to let your freckles shine through and your skin breathe. With that being said, you still want to protect yourself from the sun and conceal any breakouts or unevenness you may have. And there is a way to do it all… Tinted moisturizers are your skin’s summer BFF. Nearly every brand around makes one, but some are definitely better than others. And one that may do wonders for you would be miserable on your sister. So let’s dive into the best and worst tinted moisturizers for you to indulge in this season. One of the more affordable options is the Neutrogena Hydro Boost Hydrating Tint. In fact, this won the 2017 Allure Best in Beauty Award, and I can personally attest to the fact that it is mightly nice, surprisingly thick and creamy for a tinted moisturizer, and feels lightweight on the skin and provides decent coverage. It has hyaluronic acid, a super moisturizing ingredient said to improve the skin. I can’t say I’ve noticed a difference there, but it definitely feels hydrating, which makes it ideal for combination to dry skin types. Although oily gals may want to steer clear, as it does not help cut down on the shine. The downsides though; there is no SPF in this, the packaging is a nightmare, and there are only 10 shades that are super cool or super warm. So if you are neutral or very deep, you will likely have a hard time finding your shade match. But with this being so well rated, hopefully Neutrogena will amp up the packaging (praying for a squeeze tube), and extend this pathetic shade range. This was the first tinted moisturizer I ever tried, and it still holds a place in my heart. As a teen I had the world’s most oily skin and the Laura Mercier Tinted Moisturizer Oil-free with SPF 20 was ideal for that. The coverage is definitely on the more sheer side, but it gives you a natural glow, while still maintaining oil control. You can also top it with a touch of powder or setting spray to lock it in even more. It does contain decent sun protection, comes in a squeeze tube, and comes in 15 versatile shades. The only downfall is that it is nearly $50, but it is nearly 2 oz. of product, which is much more than most coverage products and will last a long while. Another Allure Beauty Winner is the BareMinerals Complexion Rescue Tinted Moisturizer. This is ideal for dry skinned ladies as it is a gel cream formula. It has an SPF of 50 and comes in 16 shades. It also provides your skin with ample hydration to last all day long. This is a wonderful product for those who are aging too. It is lightweight, so it won’t settle into lines or wrinkles. Plus it gives you a youthful glow that will make you stand out everywhere from brunch to the pool. 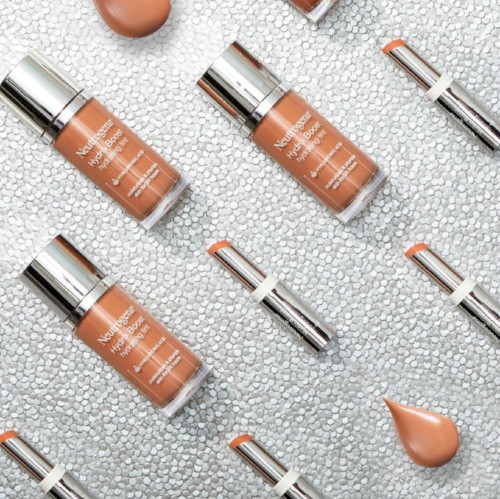 For the lightest coverage, but the lowest maintenance Glossier Perfecting Skin Tint is a winner. This comes in only 5 shades, but is such sheer coverage that it is very forgiving. This product is not like the others in that it doesn’t actually conceal imperfections, it just gives your skin an all over evenness and glow. It is definitely not for those with oily skin as it stays a bit tacky and doesn’t set, nor is it for those looking for decent coverage. It really just looks like skin only a bit better. It is best applied with your finger tips, which means there is no need for a brush or sponge - ideal for you gals on the go or the lazy makeup lovers. There is no SPF in this, so you may want to pull that into your routine in another format. But, if lightweight no-makeup makeup is your game, this is the winning product. Talking about brightening, the NARS Pure Radiant Tinted Moisturizer SPF 30 brightens dull or uneven skin instantly. With 11 shades of this lightweight tinted moisturizer, you should find a decent match. With this, you also get close to 2 oz of product and a nice level of sun protection. If you are new to the tinted moisturizer world, this is a great one to get your toes wet. It is thin and lightweight, enhances your skin, and gives you a glow everyone will ask about. This is suitable for most skin types too, just maybe not if you are super far on the oily or dry spectrum. It is another pricier one, but the thirst for an awesome tinted moisturizer is real. Finally, more of an indie brand has released quite the product. The W3LL PEOPLE Bio Tint Moisturizing Foundation SPF 30 is for those who are looking for the best of natural cosmetics. This formula is non-toxic, organic, vegan, sustainable, gluten-free, and has so much more goodness. It hydrates, brightens, smooths, and is free from pretty much everything that you try to avoid in your makeup and skincare. With all that being said, using natural products can be a little less convenient for some. It really just depends on your priorities. Natural products often separate, have a shorter shelf life, and can cause allergic reactions. So always check the ingredients for anything you’re sensitive too. But if organic makeup brings a smile to your face, this is the tinted moisturizer for you.